The “First Time” you do something or the “First Thing” you buy is always an important moment that often has awesome feelings attached for everyone. But it can be bad sometimes if you are not careful or have some level of concern when getting into something new. For most people, canoeing is thrilling. The very first time you purchase a fishing canoe it will be most thrilling and exciting for you, like getting a new car or vehicle. But investing in your own boat is no simple task. It is a brave and determined step into the world of canoeing. As it is such a momentous moment, you really want to make sure you make the right choice. For a novice, there can be lots of new terms and different features to look at, so that’s why we’ve put together our top tips on buying your first canoe. 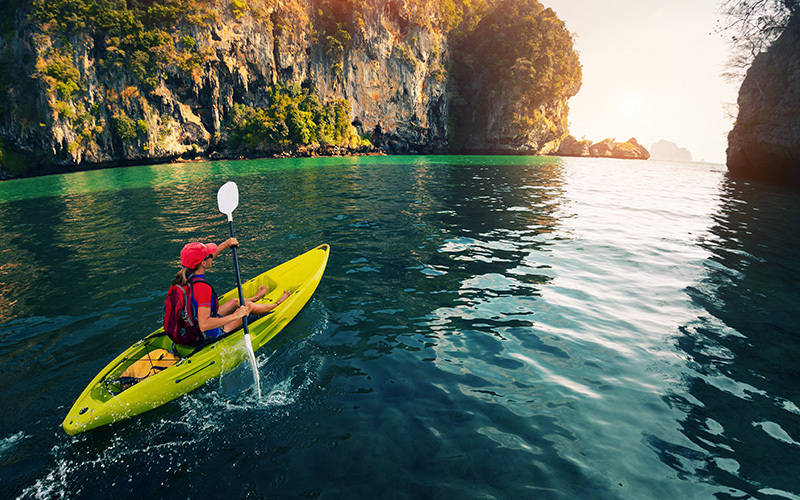 Although there are some great bargains to be had by purchasing a second-hand or used canoe, you need to be really careful not to just buy a canoe because it is simply really cheap. For your first boat we’d recommend against buying a used canoe, particularly from sites like eBay or other auction sites, as you can’t see the boat and you can’t be sure it is exactly as described. One of the most important things to do is to try the boat on the water before you buy it. Most places will have one you can’t try. Who you are giving a canoe a go, think about its size, shape, material, value, performance, purpose and affordability. Although lots of us have a budget in mind and investing in a canoe can seem like quite a costly one, it is really important not to be completely driven by price and price alone. If a canoe looks too good to be true, then it probably is. You will easily find lots of cheaper canoes on the market, that will fit even the smallest budget, but buying a budget canoe will probably mean you have a budget experience. One of the best thins about canoeing is the wonderful feeling you get, and if that is compromised by a low-quality fishing canoe, then your money will have been badly spent. You’ll find a cheap canoe is hard to learn on, and will probably turn you off your new passion. Many people have enthusiastically joined a canoe club with a cheap canoe and soon decided it is not for them. If they’d purchased a better quality canoe then they probably would have continued to love the sport. There is a lot you can do with a canoe. Canoeing isn’t simply about getting in and paddling away, in fact, you can take on lots of different activities and adventures, all of which have their own specialist canoes. You may want to go racing, fish in lake water, take on whitewater riding, canoe as a competitive sport or just have a canoe for your own recreation. So, you need to decide what you want to be able to do with your canoe and then this can help you make the right purchase. If you narrow and tailor your search based on knowing what you want to get from your canoe, then you will end up purchasing a more perfect one! Not every canoe or kayak is right for each activity, so think carefully about what you are going to use it for and make sure you tell the dealer when you come to shop for your fishing canoe. Having a strong and stable boat is really important for beginners. Although you may not want to, as you are learning to canoe you will hit every rock in the river, so you want a canoe that can really withstand these early impacts. You should look for a canoe that is strong, but not hugely heavy. The very best type of material to look for is one that has the right balance of weight, strength and cost. If it is lighter it is easier to move, but if you are always portaging then weight should be something you think about. A good material to go for is fiberglass or kevlar, as it is stiff and also efficient in the water. When I first learned how to canoe and stepped into my very first boat that I had painstakingly researched and brought, I thought paddling would be easy. How wrong I was! In fact, for the first few times I sent the boat in the wrong direction all the time, and mostly drove it into every rock in the river. The skill of avoiding obstacles is much harder than it seems. In the end, I joined a club and had a few lessons on how to paddle well, which was a great idea. As paddling is such a key skill it is a good idea to learn from an expert rather than try to muddle through on our own. This will not only teach you the basics, but also give you the confidence to keep on stepping back into the fishing canoe. For some people, the color, shape and design of the canoe is the most important thing when it comes to buying one. However, this is a bad way to buy a canoe. There are lots of different parts of a canoe and design is probably the last thing on the list of features to consider and things to look at. The color of your boat will not help you in the water, but the weight and material will! There are lots of other features to look at including things like its size, including length, depth and width, hull shape, rocker, freeboard and entry line. If you focus on design and aesthetics you are unlikely to be able to progress well with the sport of canoeing! You need to consider many things when buying a canoe, but you also need to realize the sense of fun and enjoyment that drew you to the sport. There are many parts and accessories of a canoe to think about, but it is important to remember not to buy a budget canoe, and to remember some of the top features to look for. It is just as important to remember why you chose to canoe in the first place. Canoeing is all about a thrill and having a great time, so don’t forget this when you start learning or go through the long process of buying the right canoe for you! What is most important is to keep these top tips in mind and keep on enjoying yourself whilst staying fit and healthy on the water. Next articleHow to Be a Pro at Installing and Reading Fishfinders?